Sharks Not On Top Of Food Chain. It was never going to be pretty for the Sharks but no one expected them to put points up against the Predators. They managed a score from a long pass by their more than capable QB but that’s as good as it got as the Predators piled on 55 points of their own. The Majority of the scoring came from regular contributors WR Bobby Vahos and RB Ben Clark. The Predators, with nothing riding on this game had a chance to relax a little and enjoy the day. The Sharks had a number of injuries but got through the game. More than what some of the more established clubs have done this season. After a half time Forfeit the previous week the Falcons found themselves short on numbers again and had to call the game off. 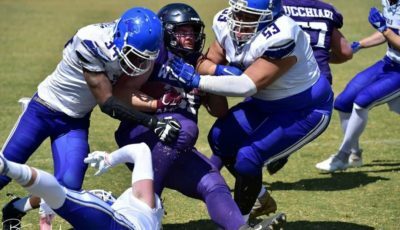 It was meant to be a big day out in Melton with the fundraiser for Lymphoma awareness and the departure of inaugural Defensive Coach Paul Grima. Unfortunately the Wolves opponents couldn’t put a side together for the trip out west. It would have been ideal to send coach Grima out on a high with a win but it didn’t eventuate. The guys decided to have a hit out anyway with the Purple Wolves up against the Grey Wolves in an epic battle of who sucked less at QB. A bit of fun was had, a few players found they are better in a different position, a speech or 2 and then the drinks flowed. Good luck to Coach Grima who has been a part of the Wolves from day 1 and led them to their first victory as Head Coach in the inaugural season 3 years ago. You will be missed by the club. Not exactly a scene from “The Pirates Of The Carribean” but it was a little wet and it involved 2 clubs with Pirate emblems. In what most would have thought would have been a comfortable victory to the Buccaneers wasn’t the case, maybe the wet conditions also played a part in what ended up being a classic encounter that was won and lost in the final seconds. After a scoreless 1st qtr the Raiders were first to put points on the board. After a huge 90yd Fumble recovery by FS Mark Padula, WR Nicholas Faure was on the end of a pass for the TD but the 2pt conversion was no good. The Buccaneers got themselves going on their next drive with a TD and XP conversion of their own to take the lead into the half 7-6. The Raiders took the lead back in the 3rd qtr with a 15yd pass to Padula, who showed his diversity. He added the 2pt conversion from another pass from QB Michael Nebauer. A few defensive victories for both sides until in the final qtr when the Buccs hit on a 50yd bomb for the TD, the XP was good and the game was tied at 14. The game looked to be heading for a draw until the Buccs were able to drive down field after an interception and eventually hitting the Field Goal as time expired, sending the Raiders into disbelief and the Buccs into a celebration. This was going to determine who would be favourite to win come Vic Bowl time but due to the Royals QB Alex Franklin getting injured during the 2nd qtr, we didn’t get to see both sides at full strength for the entire game. Not taking away from the dominance of the Crusaders who held the Royals to just 3 points after an opening possession 40yd FG by K Jimmy Iles after a muffed Kick Return by the Crusaders. On the Kickoff after the FG, WR Prince Coleman returned the ball 80yds for the Crusaders first score and the 2pt conversion to take the lead back 8-3. That was the first time all season that the Crusaders found themselves behind but it didn’t last very long. During the 2nd qtr the Crusaders were able to get a strong drive going that started from their own 37yd line and should have ended at the Royals 15yd line. Due to a penalty on 4th Down for roughing the passer by the Royals, the Crusaders were able to punch it in for the score by WR Tyson Garnham but failed on the 2pt conversion. 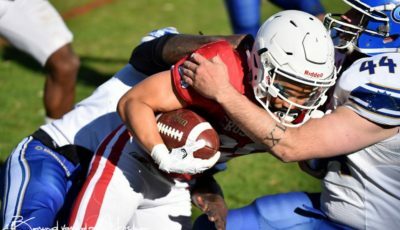 The Royals found themselves in a predicament when QB Franklin attempted a pass from his own end zone that was ruled intentional grounding and the result was a Safety to the Crusaders Defense. With the score now 16-3 it was looking like a Crusader victory was on the cards. Disaster struck for the Royals when QB Franklin was injured attempting a tackle after an Interception he had thrown. Franklin was replaced by QB Noah Sims, who isn’t as agile as Franklin but can still throw a good ball downfield. Despite entering the Red Zone on 4 occasions the Royals only managed the 1 Touch Down pass by Sims to WR Aidan Moriarty with the XP missed. The Royals had a handful of bad snaps that sent them in the wrong direction which forced Sims to throw early and scramble for his life. A highlight before the score was a bomb that was caught by WR Jacob Kerin between 2 Crusader defenders but with not much time left they needed to stop the Crusaders. They managed to get the Crusaders in to a 4th down situation deep in their own half of the field. A fake punt got the Crusaders a 1st Down and pretty much sealed the victory. After the game Royals Head Coach John Trana said “This was a physical game that will help us prepare for the playoffs. We made a critical mistake on special teams and they took advantage of it. This was a great learning experience for many of our new players. This is a starting out point for us, not an ending point. We are moving on to prepare for the playoffs and a return to the Vic Bowl”. 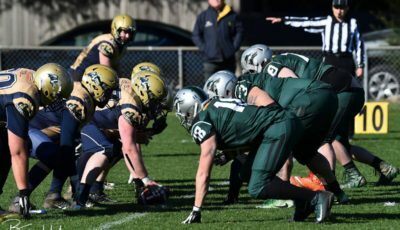 Victorious Crusader Head Coach Craig Wilson had this to say “We have got lots on film to improve now and I expect our poor performance will get the guys fired up for finals. We have struggled with multiple byes and forfeits making it hard to keep the focus from the guys. We collected a couple of injuries as well which wasn’t ideal”. 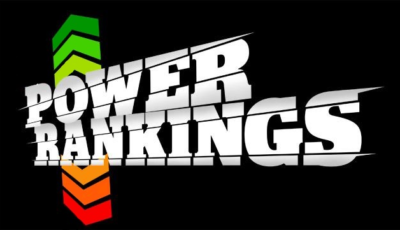 Top spot is sown up so it’s all about working on the weaknesses, if there are any. The Buccaneers are in the playoffs but will be looking to get some form back heading in. Silverbacks have had a season to forget. Another Forfeit here could see their opponent slide into 8th place. Let’s hope they can get a team together for one last crack. The Falcons find themselves with a playoff spot available if they can get a win. Not the best way to get it due to 1.5 Forfeits but they’ll take it. The Rangers are exactly where I thought they would be. This week gives the 2nd stringers a chance for some valuable game time leading into the Playoffs. The Sharks have done themselves proud and haven’t forfeited a game. They will want to finish with at least another score or 2. The Dragons are finding form at the right time of the year. With a playoff spot already sown up they will be looking to improve in every category in readiness. Despite having a tough season they have stuck it through. No Forfeits (Unless it’s this week) and the future for Monash still looks bright. The Raiders are still low on numbers but getting the job done. Finish on a high and make the playoffs or miss out due to unfortunate circumstances. The Predators have at least 7th spot wrapped up. Another club low on numbers but getting the job done. A much needed confidence boost if they can win comfortably.